This past May 5th was Cinco de Mayo! Although we didn’t celebrate with a cultural playdate like we did last year; we did focus on learning some more about the holiday and Mexico. 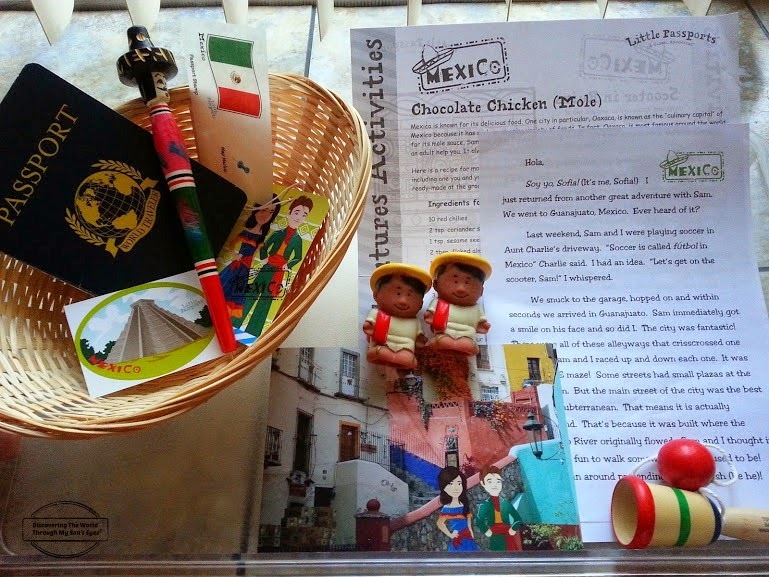 Little one recently received a package from Sam & Sofia (Little Passports) from their visit from Mexico. So we were excited to explore the package together. I also had a wooden pen souvenir from Mexico, and two cute Mexican boy finger puppets. From Little Passport we received the activity sheet, letter, a wooden toy game, stickers, and the boarding pass. We both absolutely love the book Mexico in Colors. It’s lively, and very colorful! This series of the book has a color for each page with the description of things, food, costumes, or building from each country. For example, a gray pyramid, a green iguana, and the orange, blue, and pink paint on houses. Little one was inspired to draw everything he saw in the book. He learned about the bull fights, mariachis, Aztec dancers, the Mayan pyramid, Oaxaca wooden dream animals, etc. As you can see by his beautiful art work that he really enjoyed learning about Mexico. He had fun playing with the wooden toy from his Little Passport package, and putting up the stickers on the map, and his passport. Page of the book Mexico in Colors. I used Open Wide World’s Daily Writing Spanish Prompts. It has themed writing pages to encourage little one to write in Spanish. 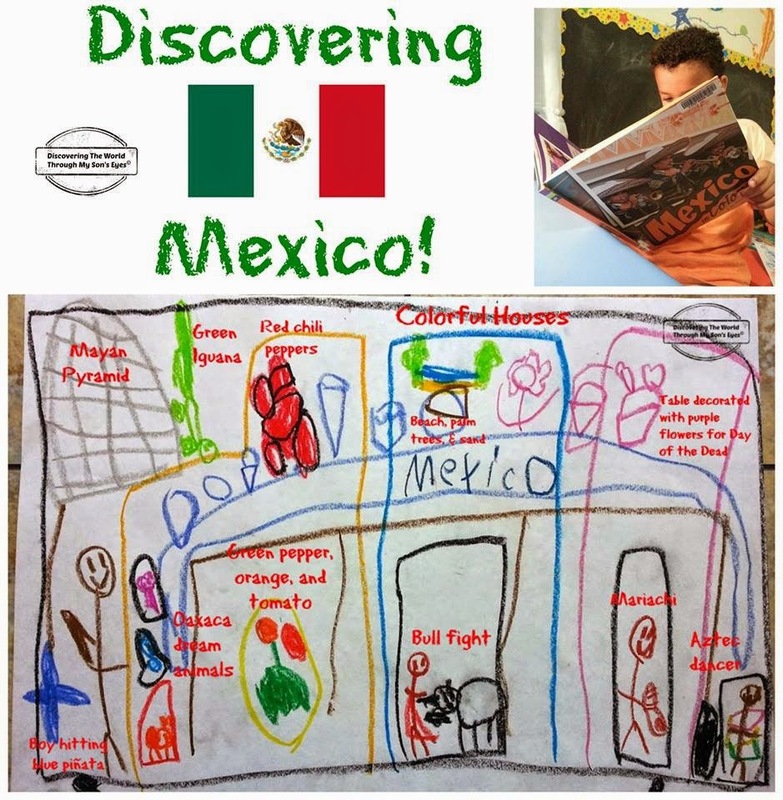 We loved the Cinco de Mayo theme pages. We played a Cinco de Mayo game from Bilingual Classroom Resources on Teachers-Pay-Teachers. The game has a map and flag of Mexico. We also had fun reading on National Geographic for Kids on Mexico. We learned about some fun facts, and information about it’s people, and culture. Mexico is the product of a rich Indian heritage, three centuries of Spanish rule, and a shared border with the world’s richest country, the United States. Today, most Mexicans are mestizos, which means they have a mix of Indian and Spanish blood. Check out the countries we’ve been learning about in our Worldwide Culture Swaps, and Little Passports Countries.